Directed by Wong Kar Wai. The Weinstein Company/Block 2 Pictures. Timing. In an interview concerning his latest film, My Blueberry Nights, Hong Kong director Wong Kar Wai explained that his film is about relationships and timing. Then again, nearly all of his films revolve around human relationships and timing. Sometimes he draws a winning hand; sometimes he comes up snake eyes. From his first film distributed in the U.S., the quirky and effervescent Chungking Express to the lush and exquisite In the Mood for Love, the director has been preoccupied with the role of timing in the fortunes for couples in his films. And, with Wong Kar Wai’s vision, it has been fascinating. He relies on images, often dazzling and dizzying, to tell his stories. My Blueberry Nights maintains this theme of relationships and “timing.” Here Wong Kar Wai focuses on body language with a sense of grace and subtlety. While his previous films have primarily been set in Hong Kong, with a sensibility that matches that culture, My Blueberry Nights takes place in the United States, in New York and in Memphis. His characters are American (except for a British expatriate café owner, played aptly by Jude Law). With the shift of locale, Wong Kar Wai seems a little unsure, as if he doesn’t truly understand the mannerisms of those raised in an American Western culture, as opposed to those of the Chinese culture (especially the Hong Kong culture -- a complex hybrid of East and West). This may be why My Blueberry Nights contains an assortment of hit-or-miss performances. In all fairness, musician and vocalist Norah Jones is not a trained actor. Unfortunately, it shows. She gives an adequate portrayal of a jilted, broken-hearted lover, Elizabeth, who frequents a late-night diner/café owned by Jeremy (Jude Law). Wong Kar Wai has worked with musicians before: He cast Chinese pop star Faye Wong as the bubbly and eccentric Fay in Chungking Express, and she was the heart of that film, playing opposite veteran lead actor Tony Leung. Here Norah Jones’ character is central, and therein lies the lack of a solid center. But the actors who play characters in the spin-off Memphis stories, David Strathairn (Goodnight, and Good Luck) and Natalie Portman, give stunning performances. Strathairn’s portrayal of Arnie, an alcoholic Memphis policeman and a hopeless romantic, goes far beyond countless cinematic clichés. He plays a real, well-rounded, down-on-one’s-luck character who has hit bottom, without the hysteria. Portman delivers a finessed performance, portraying Leslie, a slick professional card player whose profession is reading other people, reading their “tells.” Portman draws a fine line, deftly revealing her character’s vulnerabilities, while also putting on her sharp and cool con face. It is this character that truly symbolizes Wong Kar Wai’s world of two faces: the public one and the inner private one. The other missing piece here is the absence of Wong Kar Wai's longtime cinematographer, Christopher Doyle, who shot every one of his films since 1991's Days of Being Wild, except this one. Cinematographer Darius Khondji does a good job at capturing the smearing of bright, sensual colors, but he lacks Doyle’s rhythm, the timing that correlates brilliantly with the director’s cinematic language. 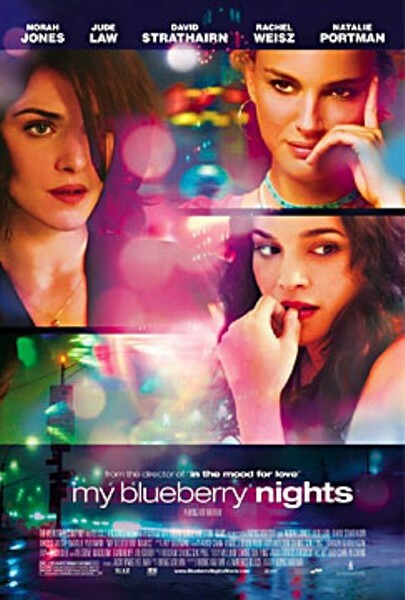 My Blueberry Nights wants to be a film of stagnation, of characters moving on, often in circles, as they try to connect intimately to one another, depending on the timing, the roll of the dice. It doesn't always succeed, though that may be more a statement about American culture and its inability to draw distinction between the true self and the public one, than a failure of the director.